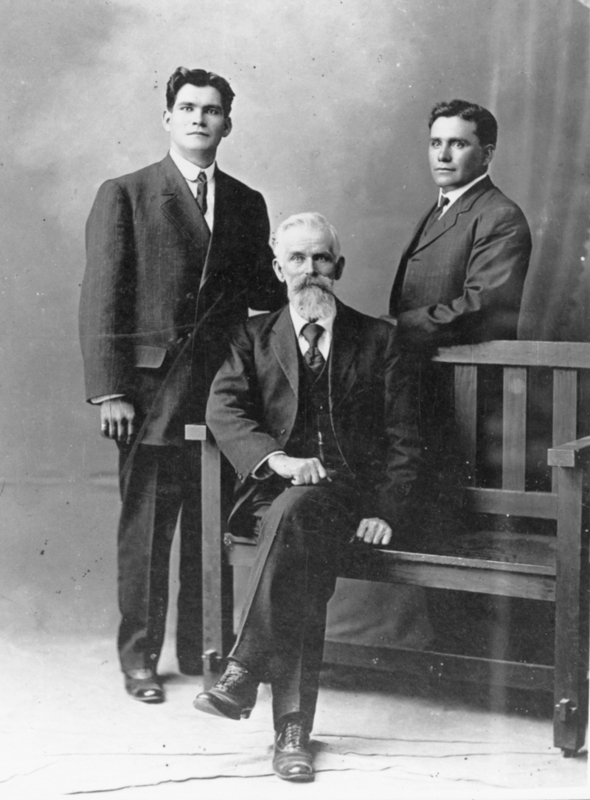 Juan Bautista Suraco, center, was a native of Genoa, Italy. He married Dominga Garla, a Californio, and in 1874 aquired the Rancho del Buque, which had been established in (misspelled) Bouquet Canyon in the 1850s by Francisco Chari. 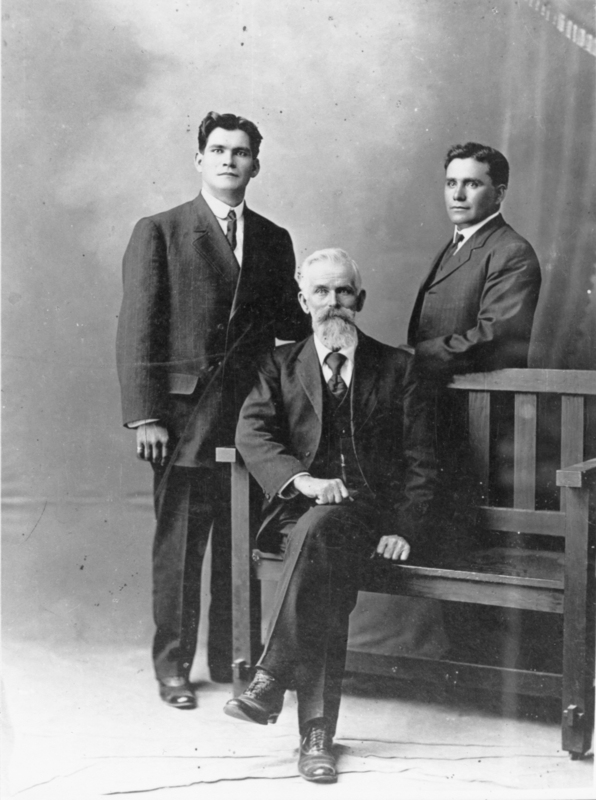 Don Juan is flanked in this circa-1900 photograph by sons Charles, left, and Joseph Antonio (1881-1951), right. When you start a story with "according to," you know you're in trouble. According to SCV historians A.B. Perkins (1891-1977) and Jerry Reynolds (1937-96), the Ruiz-Suraco adobe was built in 1845 by Francois Chari, a runaway French sailor-turned-cattle herder who came to the Santa Clarita Valley a few years earlier, changed his name to Francisco and obtained Mexican citizenship, which he needed if he was to own land. On Aug. 25, 1845, he was granted land in the SCV's Oak Canyon, where he established Rancho del Buque (Ship Ranch), which in later years became confused with flowers when the name was misspelled "Bouquet." According to the City of Santa Clarita's 2009 Historic Preservation Survey & Planning Analysis, Martin Ruiz built the adobe for Chari. Perkins and Reynolds say Martin Ruiz (subsequently?) purchased the adobe and the accompanying 300-acre ranch from Chari (or his successors). 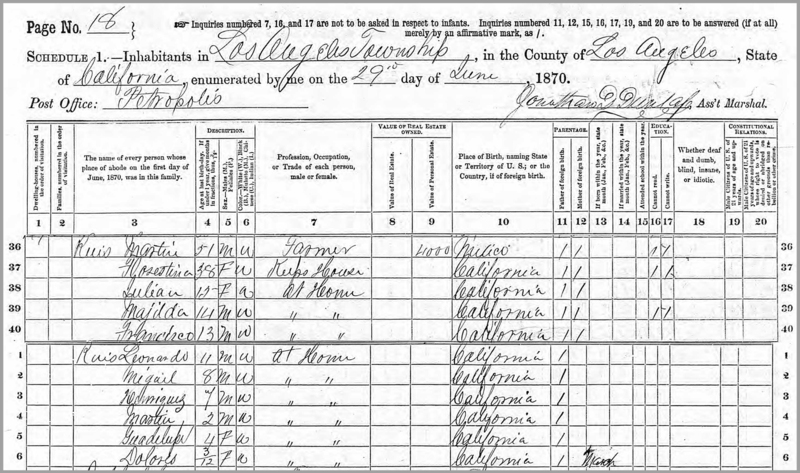 According to the California Historical Society archives at USC, which calls it the "Martin Ruiz Adobe," it was built in 1865, and Chari isn't mentioned. The Southwest Museum of the American Indian, whose collections were transfered to the Autry National Center, also called it the "Martin Ruiz Adobe." According to the obituary of Martin Ruiz's daughter, Guadalupe Ruiz Dominguez (1866-1947), "she spent her childhood on her father's sheep ranch in Boquet Canyon. Remains of the old adobe ranch house may still be seen across from the (Suraco adobe) there" — clearly suggesting the Ruiz adobe and the Suraco adobe were different structures. 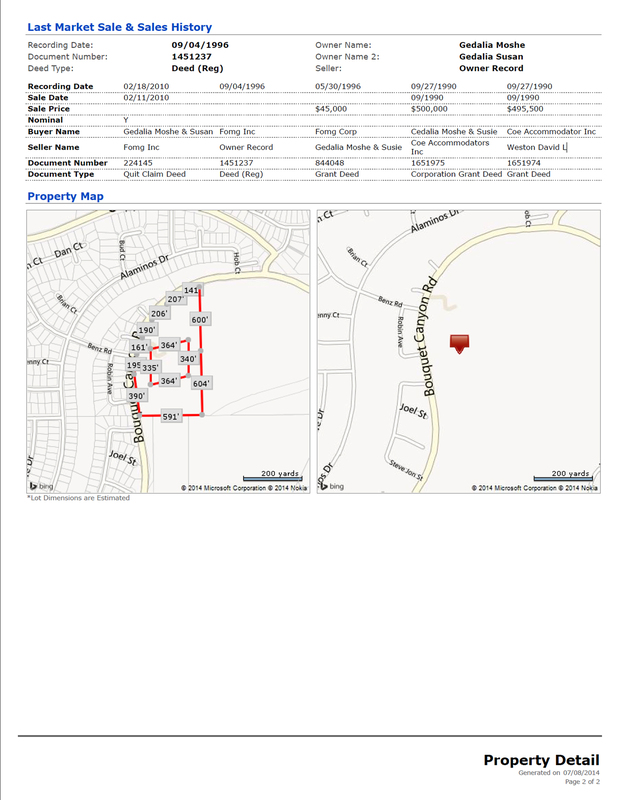 Regardless, the adobe(s) sat in the 2848X block of Bouquet Canyon Road, on the east side of the current street. As of 2013, no structures exist on the property. It's raw land. Apparently an L. Ruiz (Leonardo) expanded the long, narrow adobe around the time the ranch was sold in 1874 to Juan Batista Suraco, an immigrant from Genoa, Italy, who married a Californio, Dominga Garla. They had (at least) two sons, Charles Suraco and Joseph Antonio "Tony" Suraco. The latter was born on the property in 1881 and died in Newhall in 1951. In between, in 1917, Tony married Florence A. Helvey of (what became) Canyon Country, and the couple raised a family on the Bouquet Canyon property. By this time the adobe had fallen into disrepair. It literally melted back into the ground. The Tony Suraco family lived in a then-new wood-frame house on the other (north) side of the big eucalyptus tree. The adobe was on the south side of it. According to Charles "Pete" Benz (born 7-30-1935), the Benz family of Wisconsin, which is somehow related to the German auto inventor, bought the 300-acre ranch from the Suracos in 1940 or '41 after stopping off for a short time in the San Fernando Valley. The ranch stretched from roughly modern-day Copper Hill Drive on the north to Plum Canyon Road on the south. The Benz family grew alfalfa and established a hog farm, which is how garbage was processed in the 1940s and '50s. Food waste was trucked up from Burbank and Los Angeles, Pete Benz said, and allowed to "cook" (ferment) for a couple of years. Then the hogs ate it. Benz said he went to primary school at a schoolhouse around the bend to the north, up Bouquet Canyon Road, in a place with a lot of eucalyptus trees. (It might be the later site of an L.A. County youth probation camp.) He attended high school in San Fernando; there was no SCV high school then. Pete Benz married Barbara A. Suraco (born 9-1-1939), Tony Suraco's granddaughter. The burials are on a low hill. Photo 9-15-2013. Click to enlarge. Over time, the various Benz descendants sold off most of the 300-acre ranch in pieces to developers. Housing tracts in Plum Canyon and on the west side of Bouquet Canyon Road (Benz Road area) were once part of the ranch. According to Benz, the remaining ruins of the Ruiz-Suraco adobe were bulldozed in the 1940s and the wood-frame house was taken down about 1990 when that part of the ranch was sold to a property investor. 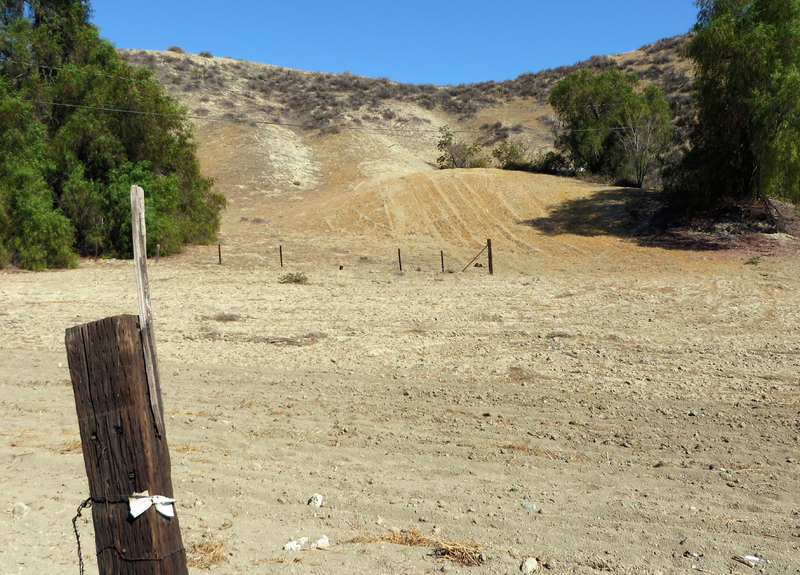 In a 2010 interview conducted at the site, Benz pointed out the location of a family graveyard on a low hill behind the former adobe where some six members of the Suraco and Chacanaca families (and perhaps other Californios) are buried. He remembered that the graves were marked with crude wooden stakes when he was a child, and he was not allowed to play there. The graveyard is not known to be listed in any modern government record. • Update 2014: Actually, it is. 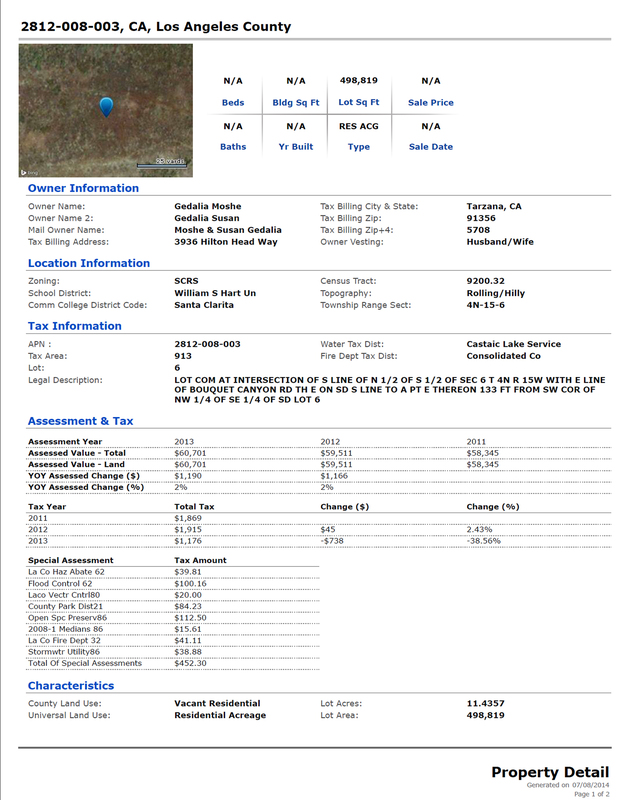 The following appears in the City of Santa Clarita's 2009 Historic Preservation Survey & Planning Analysis for the property "East of Bouquet Canyon, north of Benz Drive": "Bouquet Canyon (also called Oak Tree Canyon or Deadman’s Canyon) was settled by Franciso Chari, a French sailor in 1843; Martin Ruiz built an adobe for Chari, which was acquired by Juan Bautista Suraco, a native of Genoa, Italy in 1874; Leonard Ruiz enlarged the adobe for the Suracos and added other structures at the rear; a family graveyard was established on a low hill to the South where Juan, his wife Dominga Carla and others, including some Indians, were buried; five additional graves of Typhoid victims are located on a ridge to the east; the adobe home is gone, marked by a large palm tree; the Suraco cemetery is marked by 4 oleanders (once there were six) and the headstones are no longer extant; shallow depressions suggest perhaps six burials with two or three outside of the oleander line; no evidence of the ridgetop interments has been found." 1. Note that this Martin Ruiz is the father of Newhall innkeeper Martin R. Ruiz, who was born in 1868 and buried in the Ruiz-Perea Cemetery in San Francisquito Canyon. AP1319: 9600 dpi jpeg from copy print | Same as GR0802.